The warm beauty of Copper, intricately woven and accented with a faceted, oval, Amethyst focal bead. The sturdy frame wires were hammered and formed, them wrapped with round copper wire and antiqued. 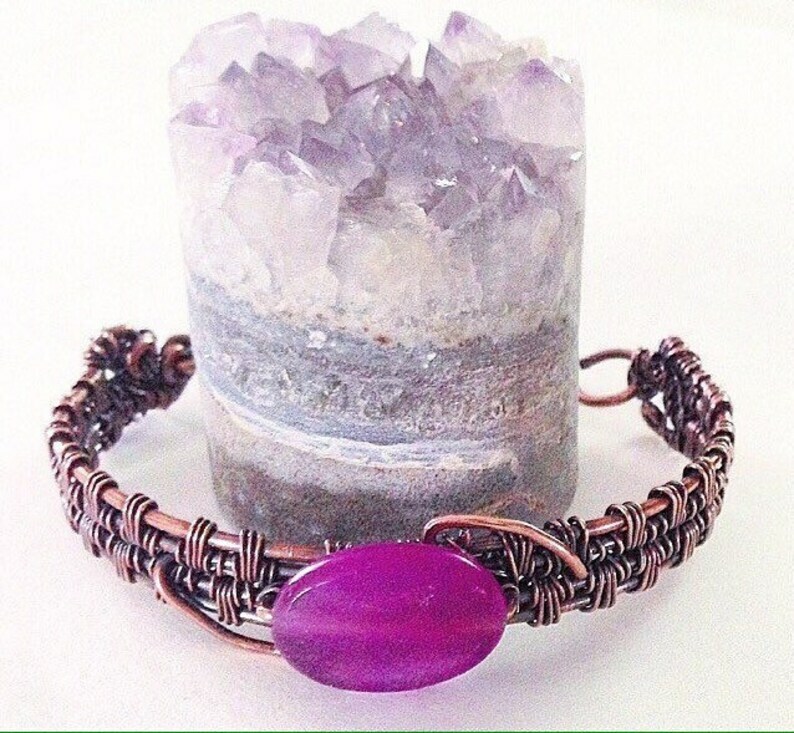 An overlay of wire and the Amethyst add an elegant touch. The bracelet is finished with hammered infinity links and a hammered hook. A metal sealer was applied to preserve the finish and to prevent the copper from discoloring your skin. Note: Bare copper (not sealed or treated) can react to the salt in your skin, causing a green or black mark on your skin, which is just the copper oxidizing. This is how copper developes that beautiful, green, weathered patina, and not a sign that the metal is "cheap". Any sealer or finish applied to copper will eventually wear off and may need to be retouched or reapplied. Clear nail polish may be applied, although it wears off much quicker than professional sealers. Be sure to thoroughly clean & dry your jewelry before coating with nail polish.